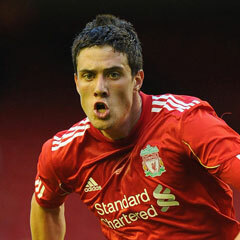 London - England manager Roy Hodgson has added Liverpool defender Martin Kelly to his squad for Saturday's Euro 2012 warm-up against Norway in Oslo. Kelly wasn't included in the 23-man squad Hodgson selected for Euro 2012 last week, but the right-back will join up for the Norway friendly to get a taste of the international scene before returning to Anfield. The 22-year-old, who has made six appearances for England's Under-21 team, had never previously been involved in a senior England squad. Hodgson has opted for Kelly over the likes of Manchester City right-back Micah Richards, whose omission from Hodgson's squad for the tournament in Poland and Ukraine was greeted with surprise in some quarters. Liverpool's Glen Johnson and Manchester United's Phil Jones are the two senior right-backs in Hodgson's Euro squad. "Liverpool's Martin Kelly will join the England squad for Saturday's game with Norway," the FA announced on its Twitter account. "Will return to his club after the game." Kelly has made 20 appearances for Liverpool this season, which included 12 starts in the Premier League.